If you love travel but can't always get to where you'd like to go, then a gorgeous book is the next best thing. 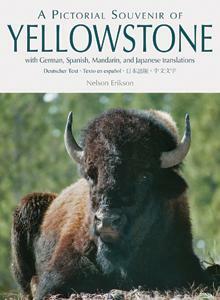 Photographer Nelson Erikson has put together a great collection of his photos from the well known National Park, Yellowstone. Some of his pictures reflect moods, seasons, the beauty of Nature and the outdoors, and he offers elk, bald eagles, lakes, springs, mountains, buffalo, birds, flowers, bears, and of course, Old Faithful. One can page through his book and imagine yourself there (if you've never been) — the sights and sounds and the beauty for miles on end. This is the kind of book I'd buy as a souvenir of a destination I'd been to (or not) as a beautiful keepsake of a beautiful place. Conclusion - A really good pictorial of a fascinating place.